The JetCard 2.0 program is our innovative approach to doing business. 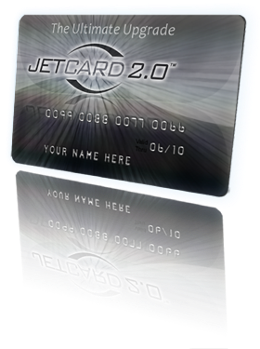 Unlike other programs, JetCard 2.0 is straight forward. No hidden fees, no unexpected costs. Simply purchase your flight hours in advance at a flat rate and fly. JetCard 2.0 clients have access to the best concierge services, prices and private aircraft charters available. Travel in style and luxury to anywhere in the world with as little as 48 hours notice. Now with our new All-Access deposit program the funds you deposit in to your account can be used for any type/size aircraft for a guaranteed hourly rate.